Planning Law – Where Art Thou? Two successive items from Wednesday night’s council meeting produced 2 staggering decisions. We can speculate as to the reasons why these councillors decided as they did however, one thing is clear. When it comes to that holy of holies (ie planning law) this council and its crop of councilors have basically no interest in applying the law as it is written. So please, no more chest thumping and statements such as ‘we have to apply planning law’ when we make decisions! 12 storeys in a heritage precinct at Derby Crescent, Caulfield East. Councillors voted unanimously to REFUSE the Weeroona Road application and to grant a permit for the Derby Crescent application. Only Delahunty and Davey voted against this second application. In both instances planning law was totally ignored in our view. Could it possibly be that the reason the Weeroona road was refused was that there were 14 objections versus only 3 objections for the Derby Crescent application – this latter fact neatly pointed out by Magee and Strajt! Please note that we are not discussing the merits of either application or whether they add to the overall housing ‘improvement’ in Glen Eira. What we are suggesting is that when time and time again councilors get up on their hind legs and argue that their hands are tied by what the planning scheme says and therefore permits are granted, that the same should have happened with these two applications. Namely, that Weeroona should have got its permit and Derby Crescent should have been refused if there was to be consistency (and may we say integrity) in this councillor group. Sadly, these two cases are just another example of behind the scenes manipulation, vested interests, and a pro-development agenda that does not give a stuff about heritage in this municipality. It is zoned GRZ1 – ie an allowed height limit of 3 storeys (10.5 metres). The building is 9.4 metres. Site area is 1024 square metres – council has granted other land subdivisions of barely 100 square metres! Dwellings are 3 and 4 bedroom – meeting needs of ‘family’ living. Thus on every major criterion upon which decisions should be based these councilors decided to REFUSE the application. Their reasons? – didn’t fit ‘neighbourhood character’ and there is a Neighbourhood Character Overlay on the other side of the street – in the NRZ zoned area. If council was so concerned about ‘neighbourhood character’ then why was this street zoned as GRZ in the first place? Why hasn’t council got off its backside and rezoned these areas or at least provided a ‘preferred character statement’ that would have some bite at VCAT? Of course, nothing has been done! We would like to be as assured of winning lotto as this application will meet with success when it goes to VCAT. Council’s planning scheme is all the developer has to point to in order to win his case! More of our money down the drain ‘defending’ the indefensible! Next there was the Derby Crescent application for a monstrous development of 12 storeys (outlined in one of our earlier posts) plus the total demolition of one of the two ‘contributory’ heritage listed buildings. Although part of the Phoenix Precinct, and yes there are tall and taller buildings in the vicinity, this should not be seen as over-riding heritage constraints in this area. The arguments of Magee, Silver, Strajt, Taylor, Hyams and Esakoff, were lamentable and had nothing whatsoever to do with planning law as it applied to this specific site. Which makes us wonder what decisions have already been cooked up between council and the VPA for this entire area? To her credit, and also Davey, Delahunty launched what must be the first ‘analysis’ of what the planning scheme actually has to say about heritage and the demolition of contributory buildings. Torres finally had to admit (through clenched teeth we assume) that ‘on balance’ heritage comes a poor second to development and that the planning report could have been better and more expansive in its commentary. Disappointingly, no one seemed to have too many qualms about sticking a straight up 10 storeys onto the top of a heritage 2 storey building so that it will literally protrude like a sore thumb – despite the fact that the planning scheme for this area is replete with statement after statement about preserving the height and ‘ambience’ of this area. We ask that readers listen carefully to the audio on this item and to ask themselves the most crucial question – why has planning law been so flagrantly ignored in these two instances? Finally, another reminder of what the majority of councillors believe is acceptable in a heritage precinct! The recent preliminary heritage review confirmed that both buildings were contributory. This was again confirmed for the application by council’s heritage advisor. Suddenly to the likes of Strajt looking at google it is non contributory. Reminds me of Lipshutz as the heritage expert. If I remember correctly the major heritage review was supposed to be completed in 2018. It’s now been consigned to the never never land of years away. That’s all the confirmation I need to assess the priority council puts on its heritage. Nothing but nothing must halt development as a decent heritage policy just might. Planning law is used only when it suits and ignored when it doesn’t. Decisions are made and then reasons sought to support the decision. Always helps when councillors are inundated with emails phone calls. Incredible decisions. My hats off to Delahunty on this one. The old guard councillors have been flip-flopping along making up their arrogant little excuses for years and years. They will be back next meeting with a 180 degree contradictions to what they said last meeting. Remember Magee said he can’t read well enough to understand the agenda and relies on Hyams to give a good rundown at the actual meeting. What hope have we got if the community keeps electing total losers to act on their behalf. Horrendous decision. Death knell for heritage in Glen Eira. I see an article in Jewish News shows Jamie Hyams dressed in the mayoral regalia beaming like a clown without the make-up. That man is such a sycophant, (MODERATORS: rest of sentence deleted). The officer report was dreadful, but our councillors should still do their due diligence. 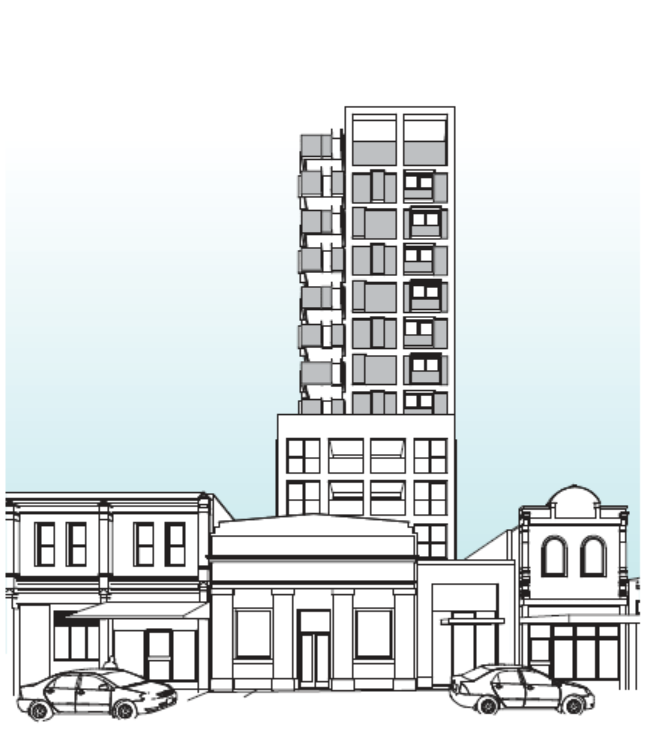 VCAT did NOT say that 10-14 storeys would be acceptable, and I hope Anthony Adams duly apologizes. Nor did VCAT decide the original application was dreadful. It instead found that the scale of appearance of the proposed tower would not be in keeping with the built form or policy contexts, and that the building would be overly dominant. So now we have a new tower proposal that is not in keeping and is overly dominant. If an objector requests a VCAT review, somebody from Council will have the embarrassing task of explaining why Council didn’t assess the application against all the relevant decision guidelines. Since Cr Silver moved the motion, he should be Council’s representative. The implications of the decision are profound. In terms of precedent you can now reasonably expect to be able to demolish 95% of a building significant or contributory to a heritage area. You can be towered over, quite literally, by something incongruous to the very character that led to the Heritage Overlay in the first place. Less than a month after Amendment C149 was gazetted, the map for HO71 Derby Road will need to be redone to reflect the non-contributory buildings that Council wishes to replace the area with. “Its architectural significance is established by the diversity of its street architecture and railway station and is enhanced by their substantially intact state””. Well no longer. I have seen it time and again Councillor Hyams does understand the planning rules; I don’t always agree with his decision but he is the only councillor who comes close to knowing his stuff. I have witnessed him question the consistency of council decisions.The other councillors are way out of there depth and appear to have a State Parliamentary seat as there only objective and are simply using the Glen Eira council to get known in the public arena. “Just there for the show; no real interest”, some councillors don’t even own property in the area so they do not have a vested/genuine interest in the area. Its about there political career, not the rate payers. Talking of which, after the great job she’s been doing for Tucker Ward I see Taylor is a Southern Metropolitan candidate…………….. The action of supporting the demolition of number 13 Derby Road in Caulfield East is impossible to justify if applying current council regulations. The Application sought the right for part demolition only but somehow our developer friendly planners and councilors failed to uphold our heritage values as recommended by their planning dept. rules. Of interest as objectors my husband made his way to the so called planning conference only 10 minutes late to find the room abandoned. We had been delayed due to an accident on our travels. I attended after 20 minutes (to speak and drive him home) and found it to be a very terrifying experience as I was all alone in our City Hall Building. This was unbelievable that everyone had left the building without attending to locking it or ensuring a security guard was present!! !.